Apart from a balanced diet, regular physical activities are widely known to be associated with substantially lower risk of adverse health outcomes, making you healthy and super active. If you are looking for gentle, time-efficient sports to add in your daily schedule, cycling is no doubt to be handed down for the best option. Check out 9 benefits of this low-impact exercise for your modern lifestyle. For those who demand for slimming down, cycling is the ideal resolution. Riding a bike means you exercise, and of course, exercise burn off your calories and fat. Moreover, the metabolic rate in your body increases not only during a ride, but for several hours afterwards. The increasing of calories you burn off has a great impact on the frequency of refueling, so as the sleeping quality is improved. Sport physiologists suggest that cyclists who ride faster and longer distances lose three times more fat than those who cycle constantly but at a slower pace. Cycling improves your heart health effectively by reducing the heart rate, so your heart beats less frequently and less stressed toward intense conditions. Blood pressure, which controls blood circulation in our arteries, is also lowered due to the ejection of large blood volume flows into each contraction. As a bonus, you will promote cardio-respiratory capacity and cut your risk of developing cardiovascular diseases significantly. Studies have shown that sportsmen are less likely to have fatal heart attacks and cancer. It is suggested that if you cycle just 20 miles a week, you will reduce the risk of getting heart diseases by about 50% in compared with that of those people who do not. As you may know, sports and physical activity promote muscle performance. An adult cycling generally require 10 times the oxygen they’d need to watch television for the same period. Cycling enables your heart and lungs to work more efficiently and get more oxygen for daily activities. To gain better results, less oxygen is required and less carbon dioxide is exported during muscle building. Due to this, you will not have to breathe too quickly during the process. Additionally, a regular workout can help improve your respiratory capacity thanks to the effective controlling of the intensity and frequency of your breathing pace during exercise. Cyclists tend to gain more access to pure, unpopulated places during their riding than car drivers and pedestrians, who expose themselves to higher pollution and crowded areas. As a result, cyclists can expose to fewer dangerous fumes. Physical activities offer many benefits for diabetics. What causes diabetes is the excess of sugar in the blood. When we exercise or do sports, glucose is consumed for the muscle building, resulting in decreasing levels of blood sugar. When the human body suffers from diabetes, insulin no longer functions correctly, leading to an increase in blood sugar. Sports, therefore, deliver a better natural regulation of the blood sugar level. Cycling on an exercise bike also does wonder for insulin as well, since this hormone plays an important role in balancing blood glucose levels. Endurance sports including cycling are perfect for toning your legs and arms, along with buttstocks and back muscles. To be clear, your muscles are built in the following body parts: the glutes, hamstrings (below the buttocks), calves (thigh’s backside position) and quadriceps (thigh’s upside position). For instance, the arm muscles work harder when you tighten the handlebars in an intense effort and ride out of the saddle with a high pedaling resistance. As muscle is leaner than fat and the purpose of cycling means it does not just reduce fat, people with bigger muscles are prone to burn more calories even when sedentary. To help gain muscle benefits more effectively, it is better to create a high resistance level for exercise intense and spend lesser time on warming up. However, be rest assured that a regular exercising bike will allow you to refine the aforementioned body parts and fit bodybuilding just in moderate level. Therefore, don’t rush for the result and combine cycling with other healthy activities and a well-balanced diet. Ride a bike for a good night’s sleep. Why not? It has been proven from researchers that cycling enhances your sleeping quality just by tiring yourself out. Though a 20-30 minute early morning ride is not your preferred interest, it will help you get back to your pillow faster by night. For insomnia people, the time before getting a deep sleep significantly reduces by half and the sleeping time is prolonged for an hour or more, according to a research. By cycling, your circadian rhythm is synchronized and the stress hormone cortisol which is the major cause of sleep-related troubles will be ruled out from your body. A study showed that people who had a physically active lifestyle seem to have better state of wellbeing than inactive individuals. When you exercise, your body releases hormones especially endorphins, adrenalin and serotonin, which will regulate mood swings, counter stress and depression. As a bonus, outdoor riding creates chances for people to explore the views so that their brains flush worries and concerns away. Just 1 – 2 hours of cycling per day can be enough to give you the spirit lift needed for a day. Not only cycling, almost gentle exercises help tighten your skin and reduce the signs of aging. An intense exercise circulation is an element to provide oxygen and nutrients to skin cells in a natural way, while excluding toxins and free radicals out from the body. It also a good base within the body to optimize collagen degeneration, reduce wrinkles and speed up the healing process, therefore making you younger and revitalized. There is a reason why cycling is considered an incredibly sociable sport. When you are ready to get out of your own room for saddling up, chances are you are going to see many places and people. Even when you are just a solo rider, you are still given opportunities to gather up and interact with others. Community participating may decrease blood pressure and strengthen your immune system, thus cutting down the risk of premature death and depression. 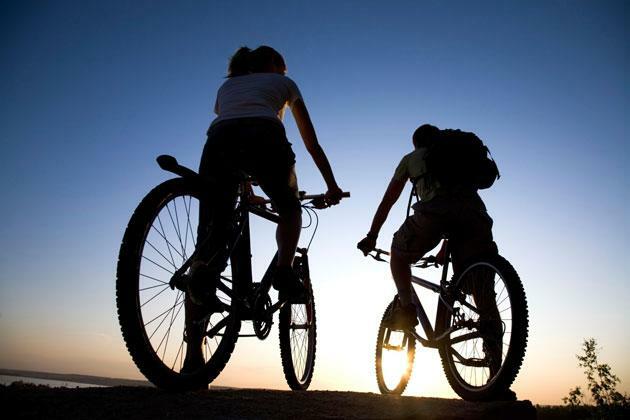 A feel-good hormone called oxytocin released during cycling also helps you tighten the relationship with your partner. Inviting friends or joining cycling groups for social purposes are excellent ways to enlarge your social circle. Victoria Tan is an enthusiastic Health and Beauty expert with more than 8 years of experience in Health Care industry. For more health care tips on healthy living, visit her at the website TrueRemedies.com. There, you will find posts on natural treatments, recipes, healthy foods, and so much more.